Charities have long relied on their supporters to generate funds for them via sponsored events. In recent years however, ‘peer-to-peer’ (P2P) fundraising - that is, charity supporters raising donations from their peers, who are asked to ‘sponsor’ some activity that they personally undertake (e.g., running a marathon) – has become widespread. Individual fundraisers can use online fundraising platforms to set up personal fundraising pages, via Facebook and other online social groups. This allows them to reach out easily to friends, family, and colleagues in order to collect donations and have them passed on to their chosen charity. Since 2001, JustGiving, the biggest P2P platform, has seen 24 million people raise money for charity to support different causes. For some, the internet offers many opportunities for social contagion in giving (Lacatera et al. 2016). Donors can informally tell their friends about the charities they are supporting and, through example and encouragement, motivate members of their social groups to follow suit (as discussed in Scharf 2014). Empirical research, however, has shown that giving behaviour does not spread easily in this way. In a recent empirical paper, Castillo et al. (2014) used a novel field experiment, conducted in collaboration with GlobalGiving, to study individual fundraising incentives in online social networks. They found that only a minority of donors took advantage of opportunities to ask their Facebook friends to join them in supporting the charity they had just given to. They found that more people posted to their Facebook wall (7% of those that were given this opportunity) than sent a message to a single friend (2%); and while incentives to spread the word (in the form of additional donations to the charity) increased take-up, even with a $5 top-up donation, only 19% posted to their Facebook wall. Moreover, the messages directed to their friends to support the charity had very little effect – only 1.2% of messages resulted in any donation at all (out of all Facebook wall posts). In a different paper, Lacatera et al. (2016) come to similar conclusions. So, donors appear reluctant to tell their friends about their giving, and friends are fairly unresponsive to informal requests. But P2P fundraising pages pack a more powerful punch. In a new paper, we examined a sample of more than 35,000 fundraising pages from JustGiving, where people have asked their friends to give via Facebook (Scharf and Smith 2016). We found that nearly 99% receive at least one donation. In an average social group size, as measured by the average number of Facebook friends (332), the average number of donations is 15. Two key differences with P2P fundraising, compared to a simple ask, are that the fundraiser engages in a costly activity (the most common is running a marathon) and that friends’ donations are visible. Charities’ hope is that P2P fundraising will deliver not just donations but new supporters via fundraisers’ social groups. However, for many P2P donors the key motivation may be the personal connection to the fundraiser rather than a new attachment to the charity. Fundraisers care about the charity and how much money they raise, but donors may care mainly about the fundraiser. We call this motive ‘relational altruism’ – the motivation to give that comes from caring about someone who cares about raising money for charity. Table 1 provides evidence in support of a relational altruism motive in giving. “A personal connection to the fundraiser” is an important factor for donors in deciding how much to give, although the charity’s cause or mission ranks higher. A second piece of evidence, based on actual behaviour, is the striking negative relationship between the size of a fundraiser’s social group (measured by Facebook friends) and how much donors give, plotted in Figure 1 below. The more friends – and potential donors – a fundraiser has, the less each of them gives. 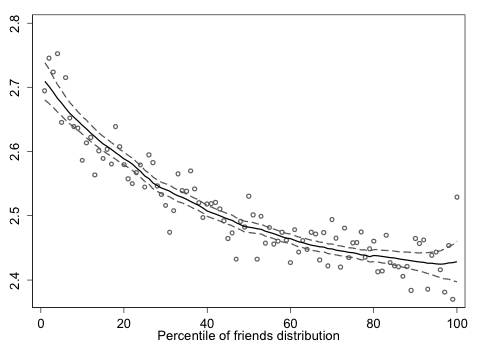 Our estimates indicate that moving from the 10th to the 50th percentile in the distribution of the number of Facebook friends is associated with a 15% reduction in average donation size – a sizeable effect. These results are robust to the inclusion of charity fixed effects – that is, comparing fundraisers raising money for the same charity, those with a larger social group will attract smaller donations. Table 1. Which factors are important in deciding how much to give? 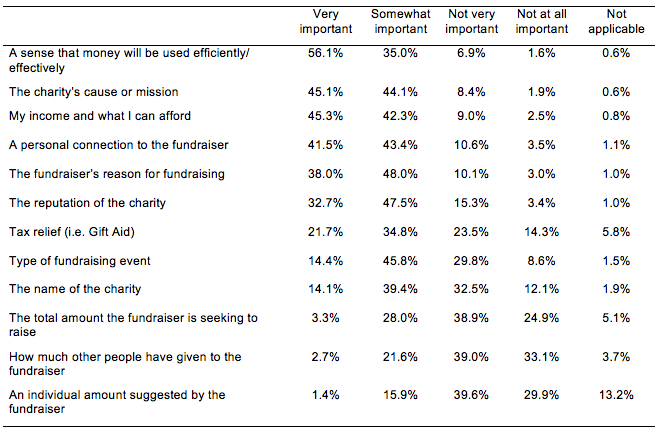 Notes: These responses are from a survey of users of an online giving platform carried out in 2012. The relevant sample for this question consisted of 17,989 people who had previously sponsored a fundraiser. For further information, see Payne et al (2012). This negative relationship between donation size and number of friends is not just a consequence of classic free-riding incentives – the idea that contributions towards common causes tend to fall as the number of contributors gets large. There are many fundraisers all raising money for the same charity, so the number of contributors to the charitable good is not the same as the number of donors to a single fundraising page. Thus, if only standard free-riding incentives were at work, the number of friends each fundraiser has should have no effect on donation size. We can rule out a number of other explanations for this negative relationship. It does not appear to depend on the fundraising target that is set on many pages (i.e. it does not seem that donors simply divide the set target by the number of potential donors), because the relationship also holds for pages with no target. Neither is it the case that it is the marginal, additional donors in larger social groups that bring down the mean — we find that the relationship holds for all individual donations to a page (i.e. the first, second, third donations to a page are all smaller in larger social groups). A relational altruism motive for giving, on the other hand, can rationalise a negative relationship between donation size and number of friends. If donors care about the fundraiser, who in turn cares about how much funding she manages to raise through her efforts, then the amount raised by each fundraiser becomes a local public good. Accordingly, there will be free-riding in larger social groups, but the public good that matters is the amount raised by the individual fundraiser, not the overall level of charitable provision for a cause. This explanation is consistent with the giving patterns we observe – as well as with the reported motivations for P2P giving. What does this all mean for P2P fundraising? One implication for fundraisers is that successful fundraising does not depend on having a large social group. In our sample, those with small social groups can raise just as much as those with thousands of Facebook friends. A second implication, this time for for charities, is that P2P fundraising may be an effective tool for delivering funds, but not for delivering long-term supporters. Donors motivated by relational altruism care about the fundraiser, not about the cause. Charities are going to have to work harder to nurture delicate social relationships if they want to generate a longer-term glow from their own fundraising efforts. Castillo, M, R Petrie and C Wardell (2014) “Fundraising through online social networks: A field experiment on peer-to-peer solicitation”, Journal of Public Economics, 114: 29-35. Lacatera, N, M Macis and A Mele (2016) “Viral altruism? Charitable giving and social contagion in online networks”, Sociological Science, 3: 202-238. Payne, A, K Scharf and S Smith (2016) “Online fundraising: The perfect ask?” Forthcoming in Social Economics, MIT press, Massachusetts. Scharf, K (2014) “Private provision of public goods and information diffusion in social groups”, International Economic Review, 55: 1019-1042. Scharf, K and S Smith (2016) “Relational altruism and giving in social groups”, Journal of Public Economics, 141: 1-10.